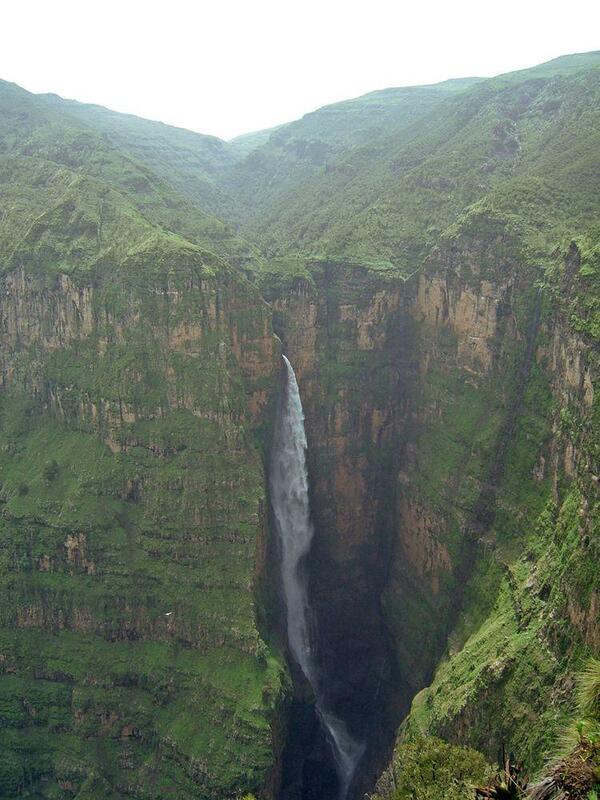 One of the tallest waterfalls in Africa is the little known Jinbar Falls, which are more than 500 m high. 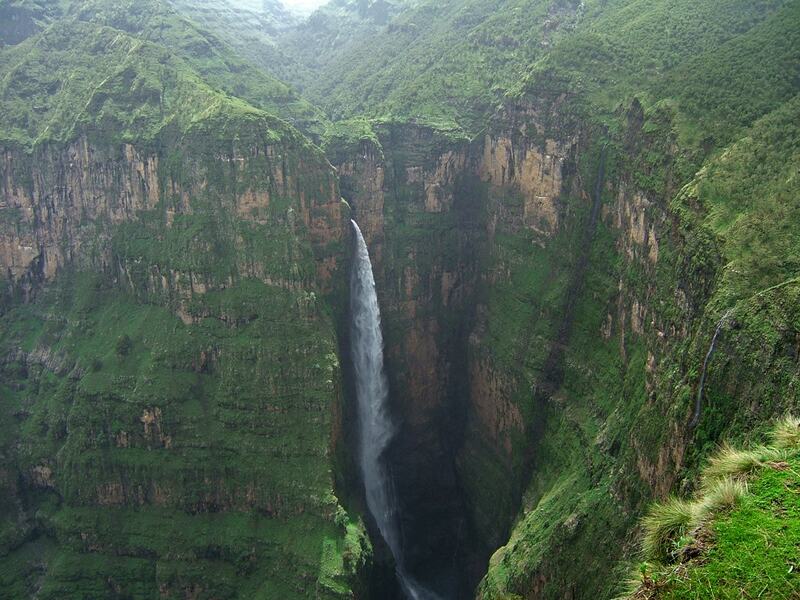 Waterfall is located in one of the most dramatic locations of Simien Mountains – in Geech Abyss. This narrow, canyon like abyss is considered to be up to 800 m deep. Jinbar river (Jinbar Wenz) is some 9 km long stream, collecting the precipitation of the northernmost part of Simien Plateau. This land is covered with unusual ecosystem – alpine grassland dominated by giant lobelias, while deeper in valleys grows a forest of Erica. As the river reaches the abyss, it falls in it from an impressive canyon. Thus their height is less than the depth of abyss but nevertheless – more (possibily a lot more) than 500 m.
The river drops like a thin line down. 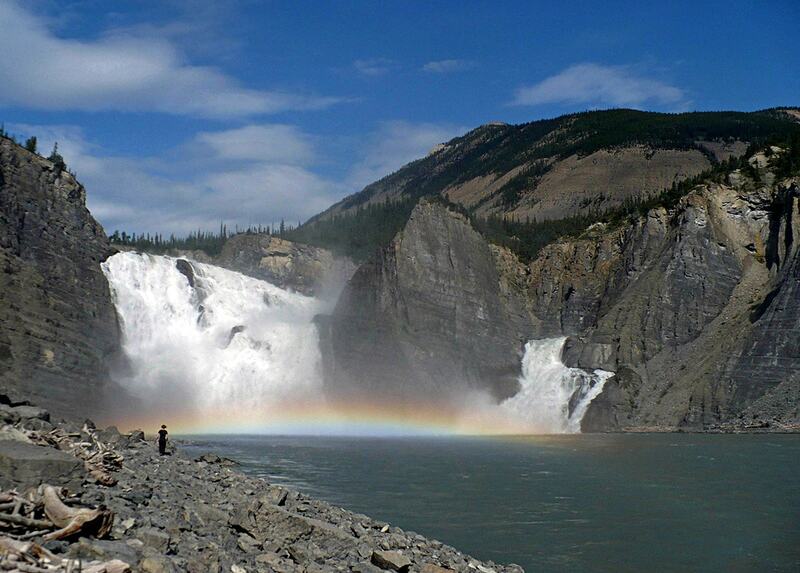 At half of the falls water is turned in mist. Fall is not entirely in a single plunge – it hits the nearly vertical cliff several times, especially if wind drives it into the cliffs. At the base it forms a smaller cascade. At rainy weather the falls become very impressive, but some water here is all the time. Almost whole fall is visible in this image by Rob de Hair. Taken in October 9, 2010. Accessed on July 18, 2011. Images: 1, 2, 3, by Brian J. McMorrow, the 23rd January 2009. Accessed on July 18, 2011. Ethiopia is very interesting country with rich cultural and natural heritage. 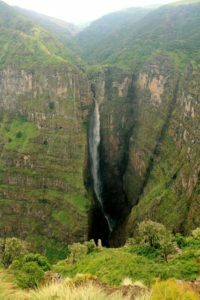 Highlights of Ethiopian heritage are its rock cut churches, ancient stelae and megaliths and places, where are found some of the oldest hominins and humans in the world. Ronald Trigg, a retired U.S. diplomat, chronicles his encounters in Africa over a twenty-year period. His thirty-six stories, set in eighteen countries, offer vivid experience and a strong sense of place. From Timbuktu to Kilimanjaro, a pygmy campsite to wildlife-rich plains, the vast Sahara to urban townships, Trigg introduces fascinating cultures, memorable characters, and unforgettable landscapes. His South African memories present an eyewitness account of the dying days of apartheid. Each chapter of The Alluring Temptress is a stand-alone story guaranteed to whisk away the armchair traveler to a new and exotic locale. What if the very country that claims the Cradle of Humanity is also the next Mecca for adventure: In March of 2007, four women traveled to northern Ethiopia to climb virgin sandstone towers in the Horn of Africa. They explored rock monoliths in a region that is best known for the drought and famine of the 1980 s and was the site of one of the bloodiest massacres of the Derg. Vertical Ethiopia is the narrative of their journey. Geech Abyss and Gishe Abbai (Gish Abbai) are two different places of interest >200 miles apart. 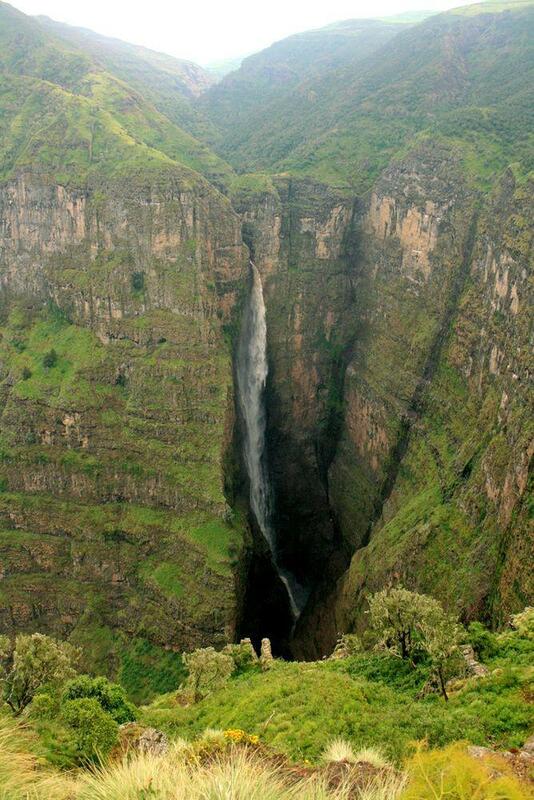 As the name indicates, Geech Abyss is about a vertical realm at Geech n the Simien Mountains. Gish Abbai, on the other hand, denotes the springs of the Abbai river; that is, the Nile, near Lake Tana. Gish Abbai simply means Nile Springs. Many, many thanks! Such comments are very valuable.